437D, Opp, BDA Complex, Vivekananda Road, HBR Layout 1 Stage, 2 block, Bangalore - 560043, Karnataka, India. 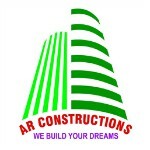 AR Constructions in Bangalore leading property developers. Through the combined use of traditional and contemporary aesthetics, we have made timeless and classic homes in Bengaluru. Our organisation that is highly focused on delivering economical and quality products in a timely manner with utmost perfection. AR Constructions expertise has been high–end and mid-segment residential projects catering to the discerning and quality conscious clientele. This allows the company to set the highest standards throughout construction processes.